Currently, Sri Lanka has 29 National Parks under the supervision of the Wildlfe Department, 10 national parks are covering areas of more than 100 square kilometres each. Those 14 covering more than 50 square kilometres each and the small Lahugala-Kitulana National Park are wildlife sanctuaries, home to those mammal species that can be called Sri Lanka's most beloved safari highlights, namely leopards, sloth bears and elephants. Most of those wildlife parks, except Flood Plains, are open to the public for jeep safari tours. Accomodation can be provided in all 14 wildlife parks of Sri Lanka, some offer bungalows, some declared camping sites, some have both facilities. But costs for overnight stays in national parks are high due to the fees charged by the Wildlife Department. Sri Lanka's smaller national parks were established to secure highest protection for some rare and threatened eco-systems, such as the coral reefs of Hikkaduwa and Pigeon Island near Nilaveli Beach, Gulf of Mannar marine national park Adam's Bridge, endemic Dipterocarpus zeylanicus trees in Horagolla National Park, serpentine fauna in Ussangoda National Park, highland bird species in Galway's land near Nuwara Eliya, montane rain forest on Horton Plains, feral horses on Delft Island. Small areas declared national parks recently are also Horrowpatana, Madu Road and Chandikulam. Sri Lanka's most extensive rain forest conservation zone, is not a national park, but supervised by the Forest Department. All national parks and other protected area together cover more than a quarter of the island's surface. Ecological awareness is higher in Sri Lanka than in most other developing countries. ​Each of Sri Lanka's wildlife national parks has its own characteristics and specific highlights for safari enthusiasts and nature lovers. And there are different seasons to visit them. Yala, Sri Lanka's most popular national park, is usually closed in September in order to protect the animals during the driest period of the local dry season, when severe droughts threaten to reduce some animal populations. Minneriya National Park amidst the Cultural Triangle is usually only opened from June till October, when one of Asia's most spectacular wildlife events takes place at the Minneriya lake, the elephant gathering. The neighbouring Kaudulla National Park is open all year long, a slightly smaller elephant gathering takes place here only around November. During Sri Lanka's high season, between Christmas and Easter, almost all national parks, maybe except from Kaudulla and Kumana, are worth visiting. However, the best time for safaris in Yala and Wilpattu and most other vast national parks is from June to August, when animals gather at the waterholes and sloth bears can be sightes more often due to the ripening of their favourite fruits. 1. Sri Lanka's best wildlife zones to spot leopards and sloth bears are the island's two largest national parks, Wilpattu and Yala. 4. Sri Lanka's best national parks for birdwatching are Kumana and Bundala. 5. 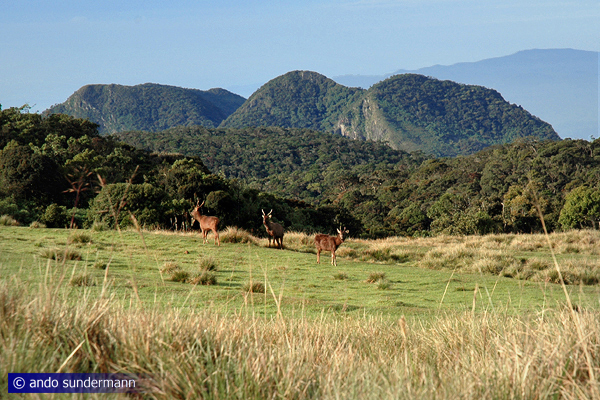 Sri Lanka's only national park where trekking is permitted is Horton Plains. 6. Sri Lanka's only national park for boat safaris is Gal Oya. 8. Sri Lanka's best wildlife area which is not declared national park is Randenigala. Yala, of course, is Sri Lanka’s most famous national park, and it's the most beautiful, diversified and exciting one on the island. Yala National Park consists of 5 blocks. The most visited area of Yala National Park is Block 1 in the southernmost part of Yala. 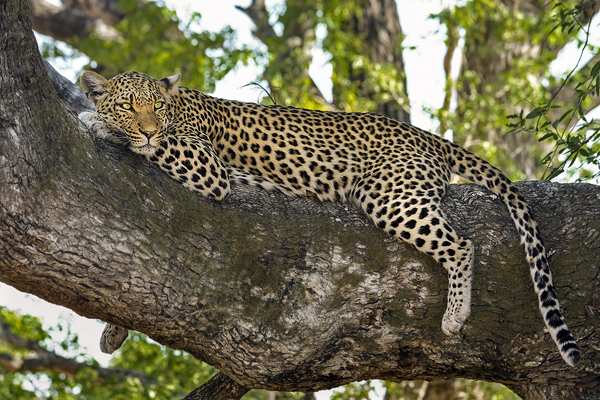 Leopards can often be observed here sleeping on rock boulders or trees. But Yala block 1 is often crowded with jeeps of day-trippers. Real wildlife enthusiasts will take two or more days to explore the less well-known parts of Yala and to enjoy a moonlight safari, too. Blocks 3, 4 and 5 are situated north of Yala and covered with a thicket of shrubland, offering less observation opportunities. The rarely visited Block 2, stretching along the shore between block 1 and adjacent Yala-East/Kumana National Park has large areas of of open grassland, making block 2 an ideal place to observe wild animals. Entering Yala Block 2 requires special permission. Bundala National Park, the former bird sanctury, is covering an area of 6,200 hectares at Sri Lanka's south coast between Yala National Park and Hambantota. Due to its lakes and lagoons filled with brackish water, Bundala is a paradise for water birds. All aquatic bird species native to Sri Lanka occur in Bundala. Bundala National Park is famous for Sri Lanka's largest colonies of migratory Greater flamingos (Phoenicopterus roseus) in particular. Bundala is serves as a favourite wintering ground for many birds from northern Asia and the Himalayas. Altogether 197 bird species have been detected in Bundala. Furthermore, 324 species of vertebrates occur in Bundala National Park. Besides Yala. Bundala is the national park with best chances to observe both crocodile species of the island on the same day, viz saltwater crocodiles in the lagoons and mugger crocodiles in the freshwater lakes. 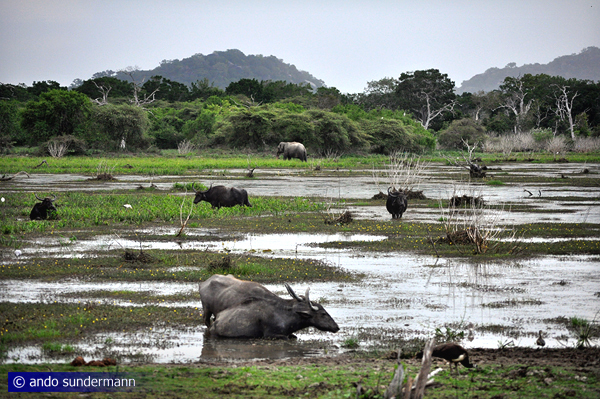 Kumana National Park is also known as "Yala East". Kumana is Sri Lanka’s national park for birdwatchers in particular. It has the highest number of bird species, The reason for this abundance in birdlife are the many lakes and lagoons of Kumana National Park, the latter being called Kalapuwas. Combinations of small lagoon brack waters and bracky swamps and ancient freshwater tanks are ideal habitats for aquatic birds. Still existing ancient tanks contribute to e abundant birdlife in Kumana. 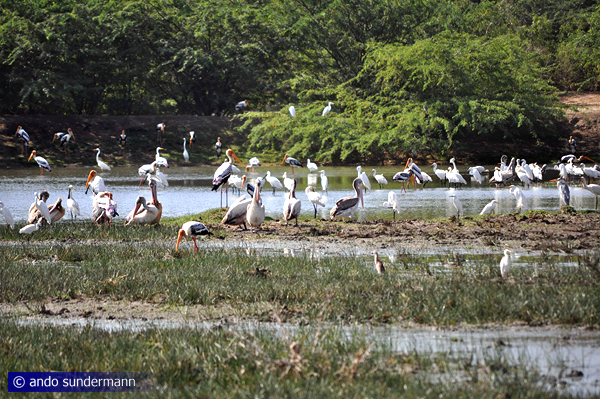 225 breeding and migratory bird species occur in this Kumana National park. There are more lakes and less rocks in Kumana than in the adjacent Yala National Park, but all in all, the sceneries are quite similar. Because it is much less frequented than Yala, Kumana is still an insider tip for natur lovers. The classical 3-day safari from Yala block 1 is crossing Yala block 2 and to a camp in Kumana. Lahugala-Kitulana is a very small National Park situated 15 km west of the east coast city Pottuvil. Lahugala is part of Sri Lanka's southern elephant corridor, crossed by wild elephants when migrating from Yala/Kumana to the large Lake Senanayake in the dry season. Thus northern hemisphere summer months are the best period to visit this national park, then up to 150 individuals gather here, because Lahugala-Kitulana has four natural lakes and plenty of tall Beru grass, which is the elphant's favourite food. Wild elephants can easily be observed at the Mahawewa lake, which is close to mainroad A4, which crosses the entire length of the park. This way, travellers don't need to take part in a safari expedition. 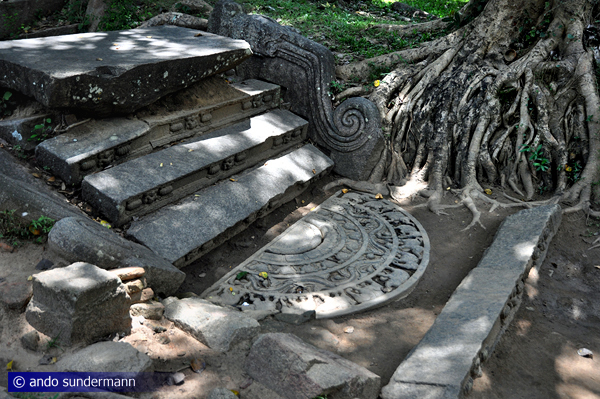 Lahugala is also interesting for heritage tourists, as it includes the ancient Magul Maha Vihara. South Sri Lanka's only moonstone rich in details was found here. Gal Oya is a river originating in Uva and crossing the Ampara District. As part of an irrigation scheme started in 1950, the river was dammed at Inginiyagala. The new reservoir, Senanayake Samudra, is named the first Prime Minister of Ceylon after independence. 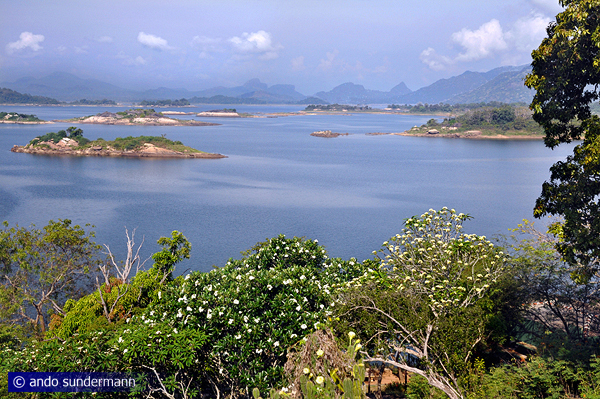 The largest lake in Sri Lanka became the core of the Gal Oya National Park. The scenic lake is spotted with islands and has many coves. More than 150 bird species occur in this area. Raptors such as Sri Lanka’s largest eagles, White-bellied Sea Eagle and Grey-headed Fish Eagle, can often be sighted here. The office of the Gal Oya Park is just below the Inginiyagala dam. Boat safaris start at the dam, they should be booked one day in advance to ensure guides will available. The best time to observe elephants gathering in the evening is the dry period between July and September. Some of them can be seen swimming to the small islands. Udawalawe National Park was created to provide a sanctuary for wild elephants which had been displaced by the construction of the Udawalawe reservoir. 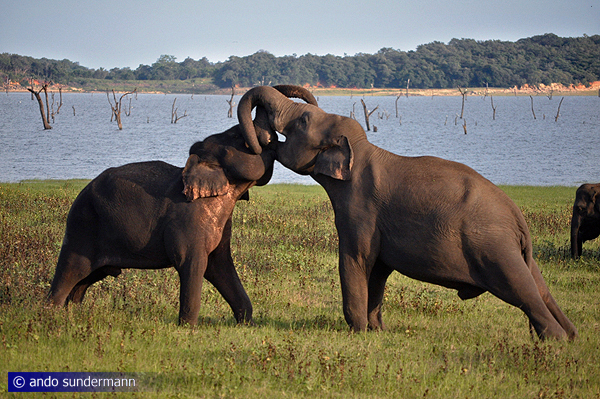 Approximately 700 wild elephants live in Udawalawe National Park, on circa 30,000 hectares. Visitors can see elephants in small herds of half a dozen or a dozen females and babies and juvenile males. Groups of adult male elephants are smaller, old tuskers are often solitary. Attached to Udawalawe National Park is the Elephant Transit Home, supported by the international "Born Free Foundation". Feeding times are 9 am, 12 noon, 3 pm and 6 pm. 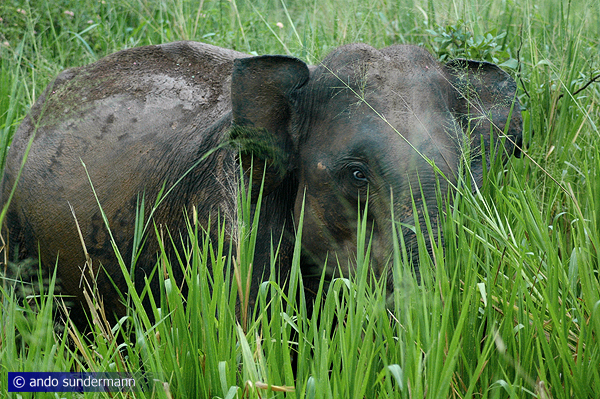 This Elephant Orphanage's aim, in contrast to Pinnawela, is to return the elephants to the wild. Besides elephants, 42 other mammal species, 21 fish species, 12 amphibian species and 33 reptile species, 184 bird species and, among other invertebrates, 135 species of butterflies have been recorded in Udawalawe National Park. Kaudulla National Park at the historical tank of the same name is located not far from Minneriya National Park, at the morthern side of the Anuradhapura-Habarana-Polonnaruwa main road A11. Kaudulla is part of the largest bird area in Sri Lanka’s dry zone belongs to the island’s most important elephant corridor, too. Sri Lanka’s famous "elephant gathering" taking place at Minneriya tank during summer months shifts to Kaudulla in October. The best period to visit Kaudulla then lasts till December. The best time of the day to observe big herds is the evening. 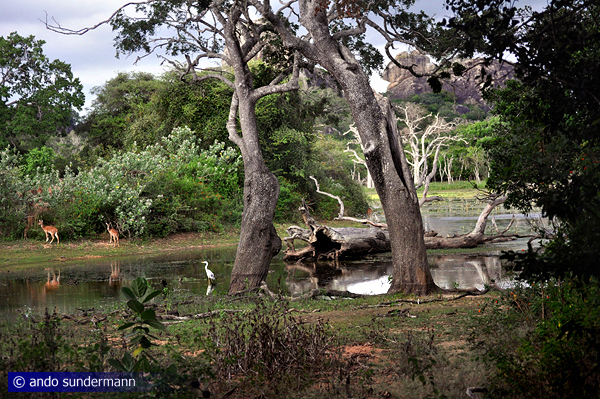 Kaudulla National Park is home to 24 mammal species, 25 reptile species, 26 fish species, and 160 bird species. Kaudulla is one of the sites where the extremely rare Gray Slender Loris was sighted and Sri Lanka’s only national park where an albino Chital has been sighted. Jeep safaris start from Habarana or Sigiriya or Giritale. Minneriya is a historical reservoir for irrigation purposes, of course, but right from the beginning it was intended to benefit wild animals, too. It has been a success story for 1700 years now. 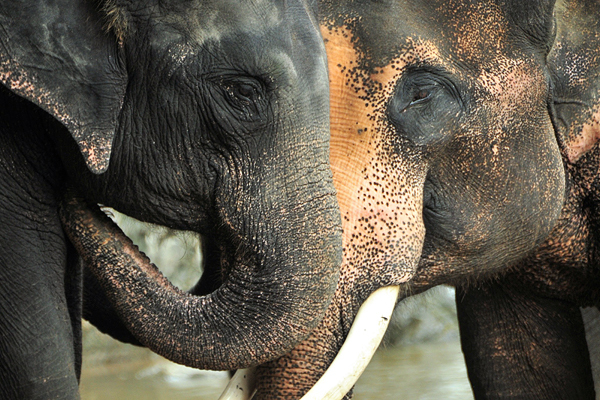 Minneriya is the place where the largest numbers of Asian elephants can be sighted at once. During the "Elephant gathering" season between July and September, herds of 200 wild elephants are not unusual, occasionally more than 300 individuals gather at the Minneriya lake in the evening to enjoy their bath, when water elsewhere has dried up. Minneriya National Park, though of relatively small size, harbours a wide range of habitat types, viz dry zone evergreen forest, wetlands, grasslands and overgrown chena cultivation areas. Other mammal species harboured in the park are Sambar, and Spotted Seer, Macaque and Purple-faced Langurs. Sloth bears and leopards occur, but are usually hidden, not spotted by visitors. 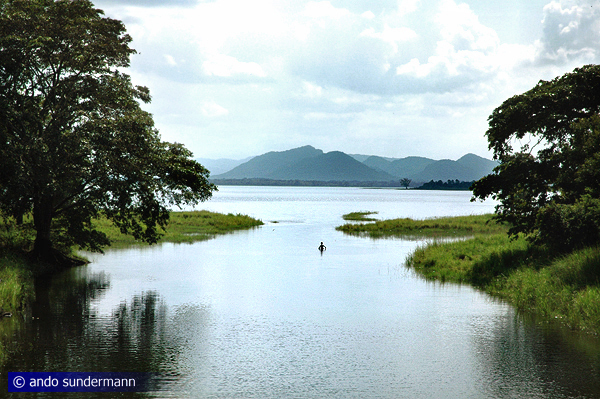 Wasgamuwa is a rarely visited national park situated just south of Polonnaruwa. Only few tourists know that herds of wild elephants can be seen at the southern shore of the Polonnaruwa's lake Topa Wewa, with herds of almost equal size as in Minneriya National Park's famous "Elephant Gathering". But the large herds in Wasgamuwa gather in a different season, from November till May. The elephant herds cannot be seen from Polonnaruwa, but it's possible to observe them on a boat tour starting there. Originally a nature reserve since 1938, Wasgamuwa was declared national park to offer a refuge for those wild animals that were displaced due to the Mahaweli River development project in 1984. 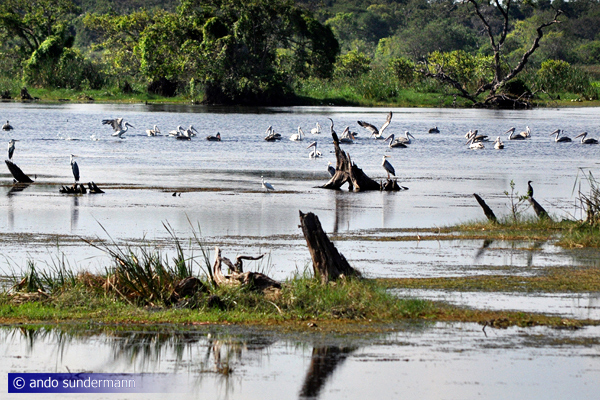 Wasgamuwa is also one of the important bird areas along Sri Lanka's largest river. The name of Wasgamuwa is derived from "Walasa", meaning "sloth bear", and "Gamuwa", meaning "wood". Horton Plains National Park, part of the World Heritage Site "Central Highlands", is a plateau at a height 2000 m above sea level. The Sinhalese name “Maha Eliya” (“great clearing”) refers to the open grassland lightnings enclosed by montane rain forest. Horton Plains is Sri Lanka’s only National Park where visitors arepermitted to walk alone on designated trails. 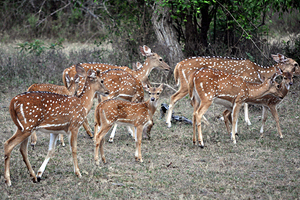 Chances to observe Sambar deer and Purple-faced Langurs are high. Horton Plains is home to an endemic subspecies of slender loris (Loris tardigradus nycticeboides), discovered in 1937, but believed to be extinct until 2002, when it was rediscovered. In 2009, one individual could be captured. The slender loris is one of five most-threatened primates in the world. The park is popular with bird watchers, too. Yellow-Eared Bulbul, Dull-Blue Flycatcher, Sri Lanka Bush Warbler, Sri Lanka Whistling Thrush are endemic to Sri Lanka’s highlands.